World War II, also known as the Second World War, was a global war which began on 3rd September 1939 in Europe, and ended in 1945. It involved most of the world's nations, including all of the great powers. It was the most widespread war in history, with more than 100 million people serving in military units. In a state of "total war", the major participants placed their entire economic, industrial, and scientific capabilities at the service of the war effort, erasing the distinction between civilian and military resources. Due to the mass deaths of civilians, including the Holocaust and the only use of nuclear weapons in warfare, WWII resulted in over 60 million fatalities, making it by far the deadliest conflict in history. When WWII broke out, Nurses from Australia, New Zealand and many other Nations volunteered as a sense of duty and eventually served in a variety of locations, including the Middle East, the Mediterranean, Britain, Asia, the Pacific, and Australia. Seventy-eight died, some through accident or illness, but most as a result of enemy action or while prisoners of war. 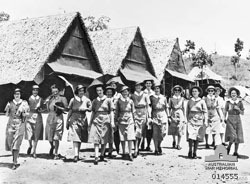 Photo on right shows Australian nurses leaving their mess huts for wards at an Australian general hospital in New Guinea, April 1941. Extermination camps also known as death camps, were built by Nazi Germany during World War II (1939--45) to systematically kill millions of people by gassing and extreme work under starvation conditions. While there were victims from many groups, Jews were mainly targeted. The Holocaust was the mass murder of approximately six million Jews during World War II, led by Adolf Hitler and the Nazi Party, throughout German-occupied territory. Of the nine million Jews who had resided in Europe before the Holocaust, approximately two-thirds were killed. Over one million Jewish children were killed in the Holocaust, approximately two million Jewish women and three million Jewish men. The war in Europe ended with the capture of Berlin by Soviet and Polish troops and the subsequent German unconditional surrender on 8 May 1945. Following the Potsdam Declaration by the Allies on 26 July 1945, the United States dropped atomic bombs on the Japanese cities of Hiroshima on 6 August, and Nagasaki on 9 August. With an invasion of the Japanese archipelago imminent, and the Soviet Union having declared war on Japan by invading Manchuria, Japan surrendered on 15 August 1945, ending the war in Asia and cementing the total victory of the Allies over the Axis. On 7 May 1945 the German High Command authorised the signing of an unconditional surrender on all fronts: the war in Europe was over. The surrender was to take effect at midnight on 8--9 May 1945. On 14 August 1945 Japan accepted of the Allied demand for unconditional surrender. For Australia it meant that the Second World War was finally over. 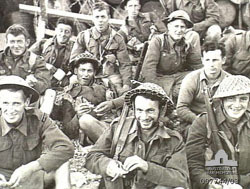 Photo on right shows troops still smiling, after many days of heavy fighting and incessant bombing, the Anzacs landed from the vessels which brought them from the island battlefield. 2 June 1941. World War II altered the political alignment and social structure of the world. The United Nations (UN) was established to foster international cooperation and prevent future conflicts. The great powers that were the victors of the war, the United States, the Soviet Union, China, the United Kingdom, and France, became the permanent members of the United Nations Security Council. The Soviet Union and the United States emerged as rival superpowers, setting the stage for the Cold War, which lasted for the next 46 years. Meanwhile, the influence of European great powers started to decline, while the decolonisation of Asia and Africa began. Most countries whose industries had been damaged moved towards economic recovery. Political integration, especially in Europe, emerged as an effort to stabilise postwar relations and fight more effectively in the Cold War. Children and some women were evacuated from the big cities into the countryside. People carried gas masks to protect themselves and built air raid shelters. All windows and doors were blacked out. "Little Boy" was the codename for the atomic bomb dropped on Hiroshima on August 6, 1945 by the United States Army Air Forces. It was the first atomic bomb to be used as a weapon. The second was called the "Fat Man" and was dropped three days later on Nagasaki.